First... Happy New Year to all those of Jewish faith! Although I'm not religious, I'm always ready to welcome in a new year... especially after this year began with the unfortunate passing of my mother nine months ago. In Numerology the number 9 stands for completion, the wrapping up of things while preparing to begin anew. So sorry its taken this long to put pen to paper and fingers to a keyboard, in updating this blog. When some 50 parking spaces are transformed into mini-parks or 'park'lets for passersby to learn something, have fun, or just relax. Only today, Friday, September 18th, I'm more rushed than relaxed. I had hoped to spend all day leisurely exploring this event, but because the city is moving towards shut-down-mode for the arrival of the Pope and The World Meeting of Families next week, my dental appointment planned during that time was rescheduled for today. 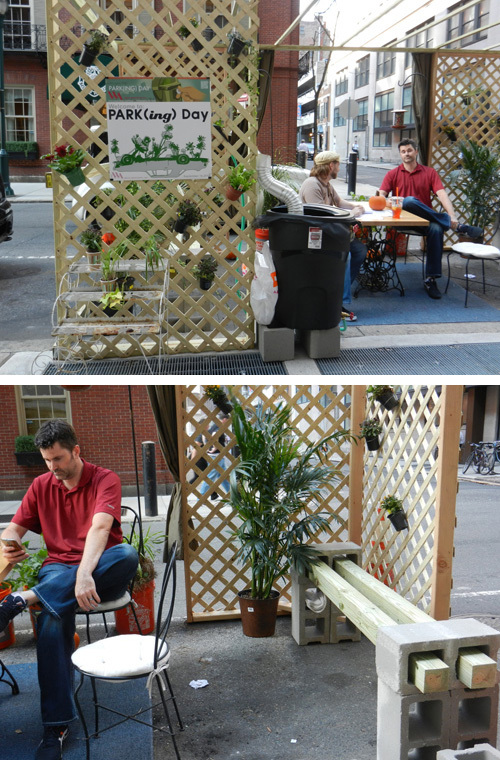 Yup... PARK(ing) Day. So now I'm racing against time... hoping to see as much as I can before my appointment, then more afterwards, but all before 4 PM when most mini- parks for pedestrians revert to metered parking for vehicles only. First stop... "Wonderland Park" by Langan Engineering with Alice welcoming everyone to a game of croquet and tea with the Mad Hatter. Then it's ... "Circus Park" by Johnson, Miriam & Thompson (JMT) where people pose behind cutout posters or dip into a plastic pool. Next... play Tic Tac Toe and Jenga or make your own games from repurposed materials with help from Gilmore & Associates. And here... Wulff Architects demonstrate how to transform a tiny backyard into a garden oasis with hanging plants and benches made from concrete blocks and pressure-treated wood. It would be nice to see more, lots more, but now I've got to hoof it... to 1608 Walnut Street, where my dentist is located. Once inside the Medical Arts Building, I run for the elevator and push the button for the 11th floor. When the doors open, I exit and turn left, down the corridor towards the last door while looking over my PARK(ing) Day map and plotting my next adventure. a door made of solid wood. My dentist's door is glass and this hallway seems stuffy and stale. I'm distracted... and on the wrong floor! I apologize, re-enter the elevator and travel up two more floors to where the hallway smells sweet, like toothpaste. 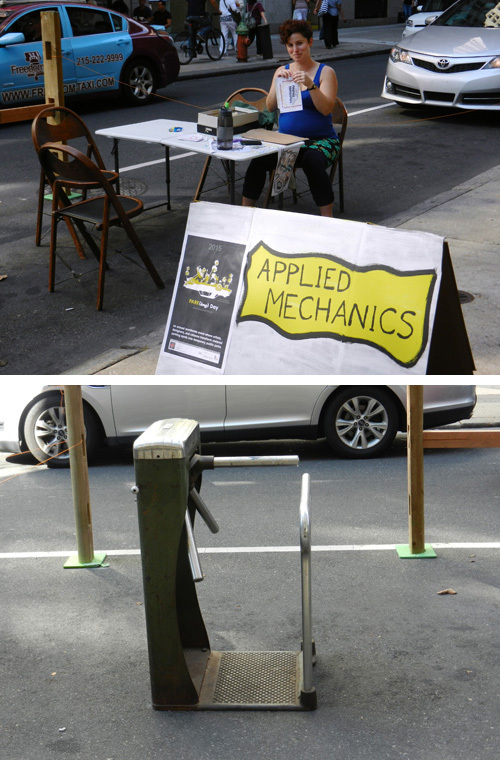 An hour or so later, my teeth are sparkling clean and I'm back on the street talking with Applied Mechanics, a theatre group that creates interactive plays. I question the 'lone turnstile to nowhere' and I'm told... "It's audience participation... pass through the turnstile and be counted." 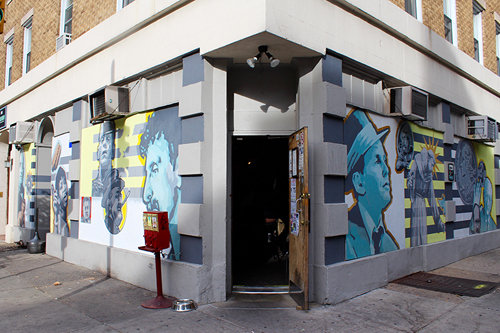 Once through, I'm handed a white slip of paper with "221 #turnstile" hand-written in orange marker. Done! 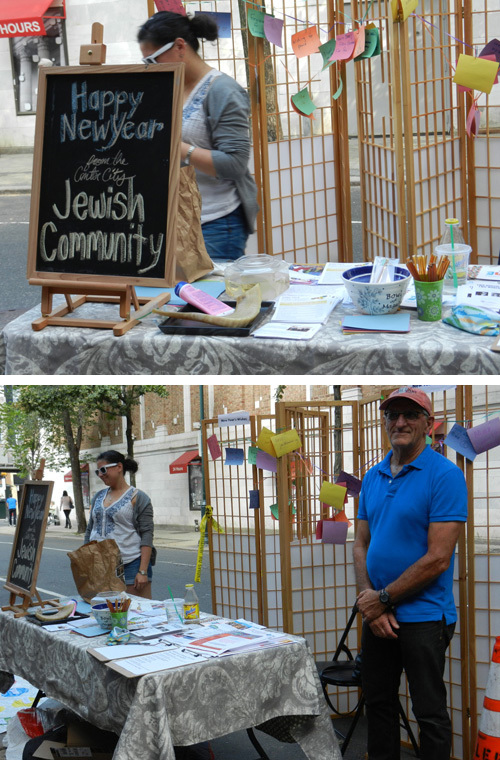 Next it's Center City Kehillah, a Jewish organization here to wish everyone a Happy New Year and an opportunity to make a wish and have it posted. I pass on the wish part (too many to post) but accept a kind gift of Laffy Taffy and honey, tokens of a "sweet and happy new year." And I'm happy to be able to relax at this "Garden Library" by Groundswell Design Group, also the creators of Spruce Street Harbor Park. How clever... hanging books, barrels as tables that offer protection from passing vehicles, and colorful chairs for sitting with a book or conversing with others. I'm told the books were purchased from a local used bookstore and I'm free to take home any publications that interest me. Wow! And Double Wow! Look who's mingling among the hanging books... the Pope! A crowd forms and now everyone wants a picture with his holiness despite being made of cardboard and propped up by a person who just arrived on a bicycle. It's 'POPE'MANIA! And all the frenzy has me on my feet moving to 16th Street and JFK where I hope to catch a few more mini-parks before they're all gone. Too late... there's nothing here at Love Park except for tourists and something green shooting up from behind the LOVE sculpture. Electric-Green water! Curious, I shoot Love Fountain from every angle including one leading out of the park onto the Parkway with a glimpse of the Philadelphia Museum of Art in the distance. I can't believe how time escapes me... I mean REALLY, REALLY, escapes me... not just missing a good deal of PARK(ing) Day, but September's gone and it's now OCTOBER!!! The Pope arrived in America, stopping in Washington DC, New York City, and Philadelphia and touched the lives of almost everyone, everywhere! Thankfully our city was ready for him. The Philadelphia Museum of Art installed the Spanish version of Robert Indiana's LOVE sculpture, AMOR, at the top of the art museum's steps to welcome the Pope in his native language. It will remain for several months in time to announce the opening of the museum's upcoming exhibition of International Pop Art. 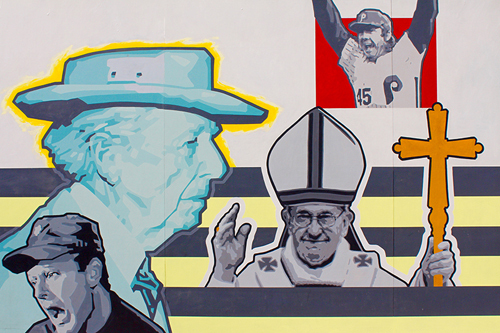 At Dirty Frank's bar (13th and Pine Streets), artist David McShane added Pope Francis to a mural of some twenty "Franks," which include... Frank Sinatra, Aretha Franklin, Ben Franklin, Frank Perdue, Frank Zappa, even Frankenstein. 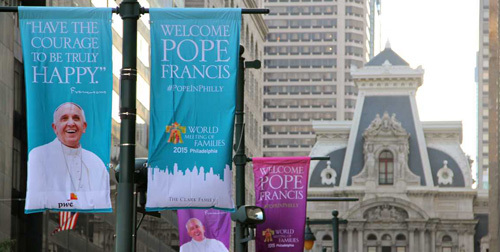 Throughout Center City, banners lined the streets. And here's the Pope waving goodbye before heading to Philadelphia International Airport on his way back to Rome. 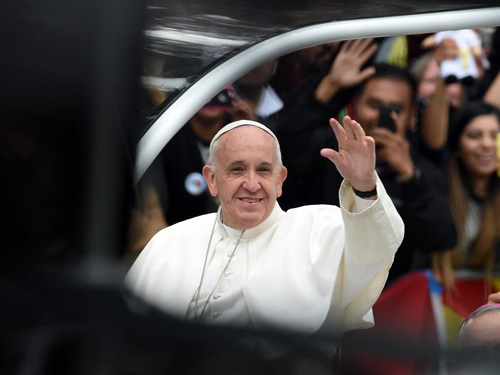 Before leaving our city, Pope Francis was asked by Time Magazine's journalist, Elizabeth Dias, "We are so curious... this was your first visit to the US. What surprised you about the US and what was different to what you might have expected?" "It was my first visit," the Pope replied. "I'd never been here before. What surprised me was the warmth, the warmth of the people, so lovable. It was a beautiful thing and also different: in Washington the welcome was warm but more formal; New York was a bit exuberant. Philadelphia very expressive..."
"Expressive"... what a great description for a city full of creative people. 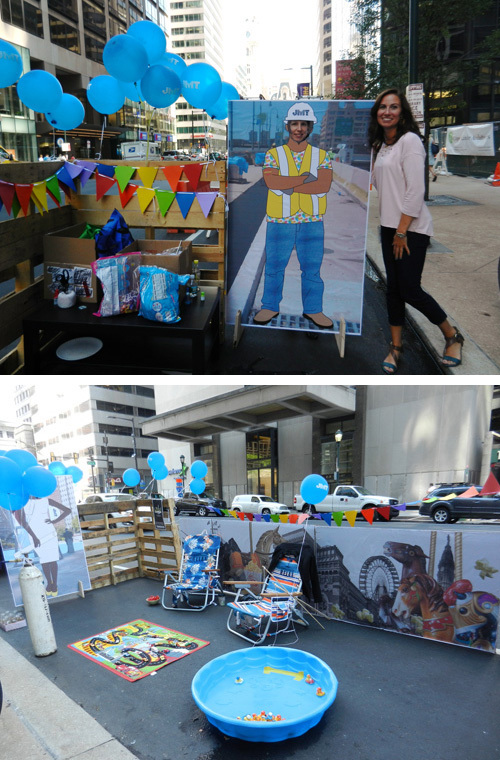 Thanks to all those expressive and creative individuals responsible for making PARK(ing) Day Philadelphia 2015 such a success! 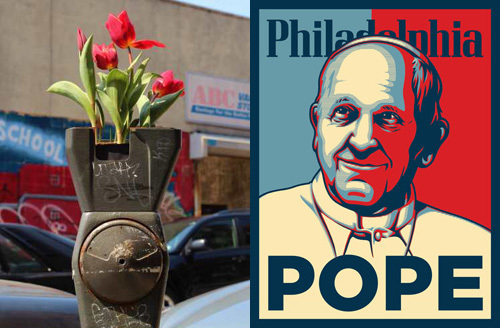 And thanks to the Pope for choosing to visit and bless our city! Philadelphia... there's so much to LOVE/AMOR. And on one last LOVE note... 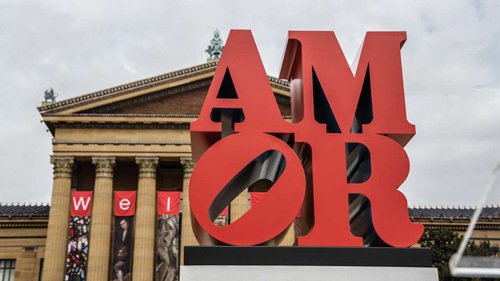 The Philadelphia Museum of Art and the Association for Public Art partnered to bring "AMOR" to Philadelphia and said there's a possibility of keeping the sculpture here permanently should the city show enough love for it. Enough love?... We're the "expressive" City of Brotherly Love!!! I remember the Parking Day lots from last year. So clever! Too bad you had to hurry through them. I hope the city keeps the AMOR sculpture. I am not religious either and have never been a fan of the Popes but I really like this Pope. So glad you're still here with me and continuing to be a big part in "Here and Next." Thanks Pal!